Since may be 2-3 years shimmer inks became more visible in the fountain pen and ink “scene”, I would say. I never had a huge like for these inks but I tested one exemplar. It was the J. Herbin ink 1670 Bleu Ocean, ca. two years ago. Actually, I was not satisfied at all with this ink. Neither it shew (and still shows) a well behavior on the technical side (it bleeds through) nor has it a well shimmer effect. I was disapointed. But may be I got a bottle from an extremely bad production day – I don’t know. Lateley, I got aware of Diamine Shimmer Inks. I was sceptical in the beginning, but from that what I saw in the web I was very excited. Well, that happens quite often. I see all the well prepared ink tests, showing copper plate tests or writing samples with very nice and adorable exceuted hand writing – very, very nice, indeed but in practice … well. I bought 2 bottles and since I was quite happy, I got 4 more bottles, afterwards. All in all, none of the Diamine inks are disapointing (to me). Quite the opposite, they have very good properties in terms of show through and bleed through, but I checked only on Rhodia White, 80g/m2 which is a quite well performing paper and suitable for fountain pen inks. However, the J.Herbin ink is actually bleeding through. The darker inks do show through quite visible but for me it is no big deal. My favorite ink is in any case the Golden Sands ink followed by the Golden Oasis. Apart from the esthetical perspective, I didn’t run into problems with the ink flow or with congested feeds, at all! This is a good sign. The Golden Sand ink contains very much of the glitter (accordong to my feeling). I filled one of my pens with it over one month and it has shown no issues in this period. Also, after one week of not using it. Hence, I trust these inks in this respect. What I anyway not dare to do is filling such an ink into a Montblanc whose guaranty (2 years) has not yet expired, because the people from MB are so picky in this respect. I heard if one encounters feed-related issues the guaranty is no longer valid for these parts of the pen. 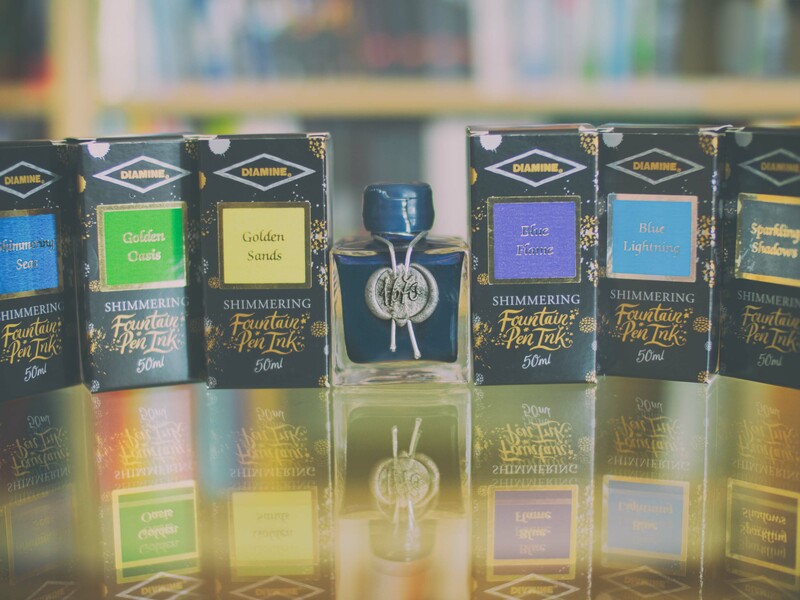 It is obvious, that it is easier to find remnants from shimmer inks than from regular inks in a feed and MB does not produce shimmer inks (per September 2017). But ok, this is for many people a no-brainer, anyway. I can summarize actually here all pros and cons because at least the Diamine inks show the same behavior. All inks are quite wet (for me it is a plus), the darker inks are highly saturated, no bleed through, a level of show through in accordance to their brightness (quite normal, I would say), a strong shimmerimg effect – here it turned out, the brighter the ink, the stronger the effect. Also, all inks show a good to phantastic shading – the brighter/lower saturated, the stronger. Everything else is a matter of taste, so enjoy the photographs and scans (individual issues worth to be reported you will find in the figure captures. Photographs of shimmer inks under daylight. Phone was placed directly above the paper, the shimmer effect becomes quite low. Even lower in case of a scan. D. Golden Oasis. Very pleasing green ink with very strong glitter effect. Great shading. Visible show through, negligible bleed through (only under pressure of the nib). D. Sparkling Shadows. A grey ink with golden flakes. Good shading as well as good other properties. Just for me the least pleasing Diamine ink I show here, but that is just my taste. Nothing wrong with it, otherwise. D. Blue Lightning. Silver glitter flakes! fitting very well to the cold turquoise color. Great shading. D. Shimmering Seas. Like Golden Oasis and Golden Sands quite flashy effect und er the right light. The in itself is quite dark and saturated. J. Herbin 1670 Bleu Ocean. Dark blue and quite shasingless ink. The glitter effect is very low! One can also say, quite decent. But for a shimmer ink too low to my taste. Bad behavior when it comes to bleed through. This ink feathers also quite strongly (at least on the Rhodia paper).